As per the Notification No.01/2017, dated 02.02.2017 Teachers Recruitment Board conducted Teacher Eligibility Test – 2017 for Paper – I on 29.04.2017 and Paper II on 30.04.2017. 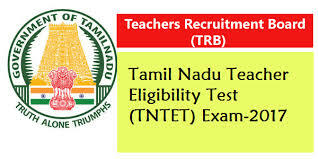 2,41,555 candidates appeared for Tamil Nadu Teacher Eligibility Test 2017 Paper I and 5,12,260 candidates appeared for the Paper-II examination. The tentative answer keys were published on 22-05-2017 in the website of the Teachers Recruitment Board and representations, objections etc. were invited from the candidates within 5 days (upto 27-5-2017). All the representations received within the stipulated time have been thoroughly examined by subject experts. After thorough scrutiny, a revised and final answer key has been arrived at and based on that, OMR answer sheets have been valued and provisional mark list of the written examination for TNTET Paper-I and TNTET- paper - II – 2017 are published herein. During the computerized scanning of OMR answer sheets of the candidates, it was found that quite a number of candidates committed mistakes in marking /shading certain essentially required details for valuation in the OMR sheets. For the candidates who have not marked question paper serial code in their OMR answer sheets, the answer sheets could not be evaluated and hence rejected. For those who have written the serial code but not shaded or multiple shaded, written serial code alone has been considered for valuation. Those Candidates who have not shaded or Multiple shaded the language options in their OMR Sheets, evaluation was done as per their options given in the application form and if there is no option in the application form their answer sheets could not be evaluated and hence rejected. The Candidates those who have not shaded or Multiple shaded the optional subject for Paper-II ( Mathematics and Science / Social Science) in their OMR Sheets, evaluation was done as per the option given in the application form and if there is no option in the application forms their answer sheets could not be evaluated and hence rejected. Now, the marks obtained by all the candidates who have appeared for Tamil Nadu Teacher Eligibility Test 2017 –Paper-I and Paper – II examination are hereby released with the final answer key.